A droite, l’Ozeki Gôeidô tacle le maegashira n°9 Takanoiwa. L’Oseki Gôeidô s’est fait peur ce samedi mais a fini par l’emporter face au maegeshira Takanoiwa lors de la troisième prise après 2 faux-départs. En utilisant la technique « watashikomi’, Gôeidô a agrippé la cuisse du maegashira le contraignant ainsi à chuter sur le dos. 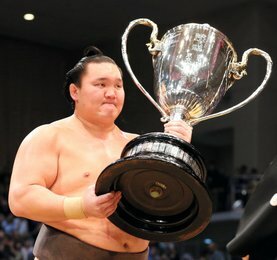 A la veille de la finale il mène ainsi d’une victoire (11-3) devant le Yokozuna mongol Harumafuji. Gôeidô et Harumafuji se retrouveront lors du dernier combat de la finale demain, dimanche. Il faudra une victoire à Harumafuji pour provoquer un playoff et espérer emporter le tournoi. Si l’on se penche sur les statistiques, Harumafuji l’a emporté 31 fois contre 11 lors de ses précédentes rencontres avec Gôeidô. Goeido devra donc défendre son titre sur ce tournoi qu’il a remporté l’année dernière sur le score parfait de 15-0. Les espoirs d’Harumafuji (10-4) sont intacts suite à sa victoire contre le sekiwake Mitakeumi (7-7) lors du dernier match de la journée. 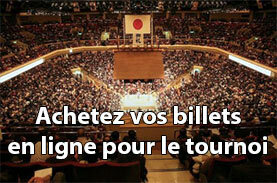 Preuve en est que le suspens a pu naître et reste entier sur ce tournoi malgré l’absence pour blessures de 3 des 4 Yokozuna actuels. Une cinquième défaite du maegashira n°16 Asanoyama (9-5) face à Onosho (9-5) a mis un terme à ses espoirs de victoire pour son premier tournoi en division makuuchi. L’ancien ozeki Kotoshogiku (9-5) a marqué sa neuvième victoire face au maegashira Daieisho (8-6) en l’amenant au bord du dohyo puis achevant l’affrontement d’une poussée au milieu. 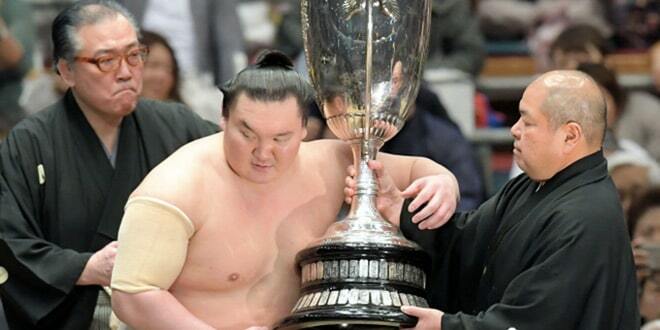 TOKYO (Kyodo) — Ozeki Goeido dodged a bullet on Saturday to rebound from back-to-back defeats and zero in on his second career championship at the Autumn Grand Sumo Tournament. 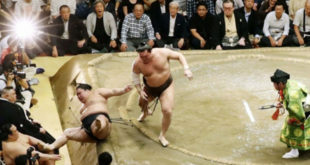 Goeido was given a serious run for his money by ninth-ranked maegashira Takanoiwa in the day’s penultimate bout at Ryogoku Kokugikan but improved to 11-3, one win ahead of Mongolian yokozuna Harumafuji. Goeido and Harumafuji face off in the final bout of regulation on Sunday, with Harumafuji needing a win to force a championship playoff. Harumafuji holds a 31-11 career record against Goeido at grand tournaments. After a pair of false starts, Goeido survived a couple of big scares against plucky Takanoiwa (8-6), but eventually came through unscathed, toppling the maegashira with a « watashikomi » thigh-grabbing push down. Goeido is the defending champion at this tournament, having won his maiden title here last year with a flawless 15-0 record. Whoever wins the championship on Sunday will have done it without having to face many of the sport’s top wrestlers. 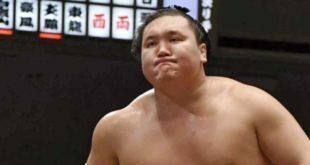 Three yokozuna — Hakuho, Kakuryu and Kisenosato — and two ozeki — Takayasu and Terunofuji, pulled out of the meet owing to injury. Harumafuji (10-4) kept alive his title hopes by forcing out sekiwake Mitakeumi (7-7) in the day’s last bout. Earlier, No. 16 maegashira Asanoyama’s hopes of a shock title win in his first tournament in the elite makuuchi division ended after he was sent to a fifth defeat. Third-ranked Onosho (9-5) grabbed Asanoyama by the throat after the tachiai charge and followed up with a two-handed shove to send him off the raised ring. 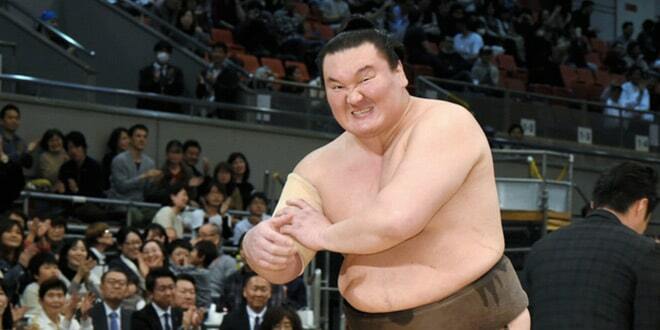 Former ozeki Kotoshogiku scored a ninth win, bellying 11th-ranked maegashira Daieisho (8-6) towards the edge of the dohyo and finishing the job with a shove to the midriff.